Remington is one upping the 2005 introduction of the Model 700 XCR with a new version called the XCR II. The XCR II sports a stainless steel barrel and receiver that are now coated with the TriNyte matte coating. Gripping the gun is made easier with overmolded rubber inserts on the forearm and grip areas. It is chambered in about every caliber you can imagine from .25-06 to the big boy .375 Remington Ultra Mag. Check out the Remington website for more info on it. Thompson/Center is introducing the TC Venture this year and I will say it shoots as good as it looks. We got a chance to test it chambered in .22-250 at the Media Day here a couple days ago and it was stacking shots well within an inch at 100 yards, which is good since TC guarantees that the rifle will shoot minute of angle or MOA (1 inch groups). For just around $500 you get a lot of what the pricier Icon offers but at a more economical price. Check it out at the TC website. The Winchester Extreme Weather SS rifle is outfitted with a Bell and Carlson composite stock that incorporates the aluminum bedding block already built into it. It is chambered in your basic calibers from .243 to .30-06 and some of your harder hitting magnum calibers such as the .300 and .338 Win Mags. Check it out at the Winchester website. 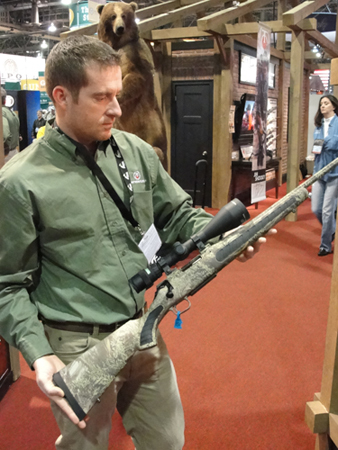 Savage Arms is introducing the Model 11 Longe Range Hunter at the SHOT Show this year. Built on the Model 110 action, the Long Range Hunter is for the hunter who knows that long range shots are going to be commonplace. Like other Savage rifles, it will also have the Accustock bedding system, AccuTrigger, adjustable muzzlebrake, and adjustable comb. Look for it to be chambered in several long-range calibers like the 6.5 x 284 Norma. Check it out at the Savage website. For all the guys that either can not hunt with a rifle or just plain prefer the awesome knockdown power of a slug gun, Ithaca introduces the Deerslayer III to its popular Deerslayer lineup. It features a solderless barrel system, adjustable trigger system (4-6#), and one of the prettier stocks I have seen on a slug gun. Check them out at Ithaca Gun. 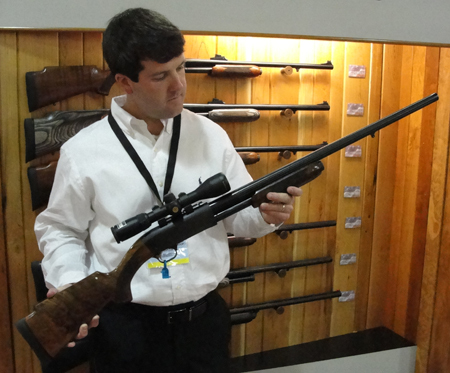 Browning has made some new headway in their X-Bolt series that was introduced at SHOT Show 2009. The new Micro Hunter shown above is perfect for the smaller framed hunter or for someone looking for a nice, smaller package for the woods. The one thing I like most about the rifle is that it is factory glass-bedded along with having a free floated barrel. Two things that are hard to find in a gun at this price point ($700). Check them out at Browning.